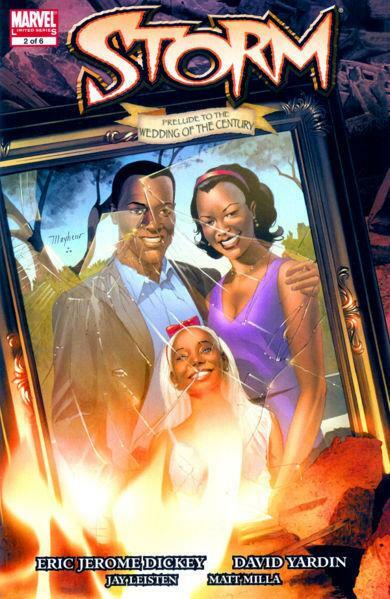 The epic, untold love story between Marvel’s two pre-eminent Black super heroes — Storm and the Black Panther — is finally told, as only New York Times best-selling author Eric Jerome Dickey can do it! The orphaned street urchin known as Ororo has big problems: Emerging mutant powers that she can’t understand, let alone control, and a crew of ruthless mercenaries that will stop at nothing to capture the elusive “wind-rider” of legend. Ororo’s only hope to survive? A boy she’s never met. A warrior prince whose fledgling skills are about to be put to the supreme test. Don’t miss out on this story, True Believer, as it builds to a July Event that will shake the entire Marvel Universe. Storm dreams of her family and the events leading up to their death. The weather around her morphs along with her emotions. The hunters find her led by her rival who suddenly tries to save her. The rival is shot and almost raped but gets saved by T’challa. Once she’s safe he heads for Storm. With her emotions raging she manages to briefly takes but is shot by a tranquilizer. Luckily she’s saved by T’challa. He dispatches the would be attackers and takes her into his arms, after their eyes meet she feints and the rest of the orphans surround T’challa. Cover- Another well illustrated cover! This time it shows the shattered picture frame of Storm’s family after her parent’s death. 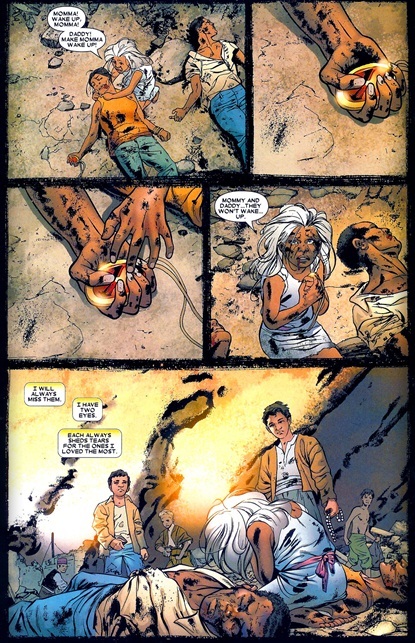 Deep and very important moment to Storm’s characterization, this death of her parents also leads to her still existent Claustrophobia. Story- This issue marks the first (cannon) meeting of T’challa future Black Panther and King of Wakanda and Storm the orphaned Kenyan princess, thief and future leader of the X-men and queen of Wakanda. Sparks fly immediately as our destined lovers stare into each others eyes. That particular scene sells the entire issue as his brown eyes meet her blue, this is the way to tell a love story! Action- In addition to the story we got quite a bit of fighting, shooting and mutant powers to boot! Hate Retcons? Stay away this is not for you!